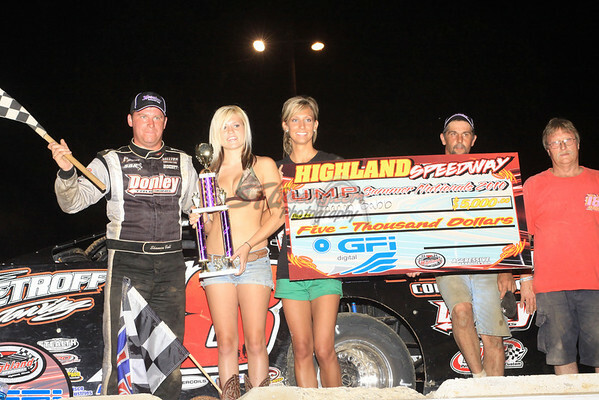 CLICK HERE FOR MORE PHOTOS FROM HIGHLAND SPEEDWAY’S UMP DIRTcar SUMMER NATIONALS! Highland, IL – June 22, 2010 – Shannon Babb found the high-side to his liking on Tuesday Night in Round 7 of the DIRTcar Summer Nationals at Highland Speedway. The Moweaqua, Ill., driver powered from his fifth place starting spot to battle with Benton, Ill., driver Rodney Melvin for the lead and by lap 22 Babb would assume command. Babb, Melvin, and defending DIRTcar Late Model National Champion Jason Feger of Bloomington, Ill., would pull away from the field as the three battled for the remainder of the 40-lap Summer Nationals feature. Babb would go on to hold off Feger on a lap 39 restart to win the $5,000 top prize. Feger would settle for second as Melvin secured third. Local driver and group quick timer Paul Bailey of Pocahontas, Ill., would come to the checkers fourth as three-time and defending DIRTcar Summer Nationals Champion Dennis Erb Jr. of Carpentersville, Ill., would round out the top five.